As World War I rages around the globe, Chan Beebe and his young bride, Elizabeth, take a steamer to Angola and trek the ancient slave trails there in search of coveted petroleum to fuel the Allies' war machine. They find a brutal continent, where death, cannibalism, and deadly fevers are commonplace. Like the hypnotic beat of a tribal drum, Beebe draws readers deep into the bush, where the expedition encounters deadly denizens, both animal and human. 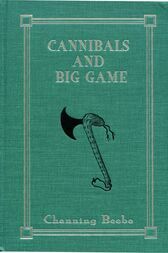 The land is a hunter's dream, with plentiful game, angry elephants, charging lions, terrifying hippo, enraged buffalo, and crocodile-infested waters. Beebe's elephant-hunting descriptions are especially riveting, and the number of hippos he shot to feed his caravan is staggering by modern standards. With Beebe's "devil gun," the team survives a bloody gunfight with a hostile king and his savage Quissama cannibals. Lured ever deeper into cannibal country by a mysterious pounding tom-tom, they stumble upon a macabre scene: Seated upon a massive throne is a dead Quissama king, his shriveled body smoked and blackened, a massive gold royal ring resting around his neck. After Beebe and his team steal the necklace in a daring raid, they flee along a midnight trail, only to cross from one cannibal country into another! Beebe's harrowing tale and multitudinous hunts capture all that was post-WW I Africa--from the magnificent beauty of the land and its creatures to the savage native cultures that have endured for millennia. Amazingly enough, Beebe's journal with the original photographs remained unpublished for more than eighty years, but now this intrepid explorer’s tale of courage and adventure is finally available!